WATER monsters you control cannot be destroyed by battle with a non-WATER monster. "Aquaactress" monsters you control are unaffected by your opponent's monster effects. 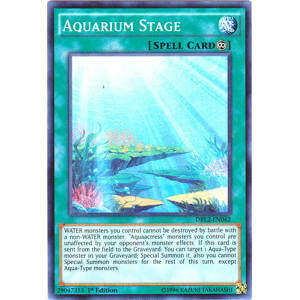 If this card is sent from the field to the Graveyard: You can target 1 Aqua-Type monster in your Graveyard; Special Summon it, also you cannot Special Summon monsters for the rest of this turn, except Aqua-Type monsters.